Tourists visiting Nicaragua often avoid the capital, Managua. The city is not too large, as capital cities go, but it's not particularly user-friendly for the uninitiated, especially for those who don't speak Spanish. 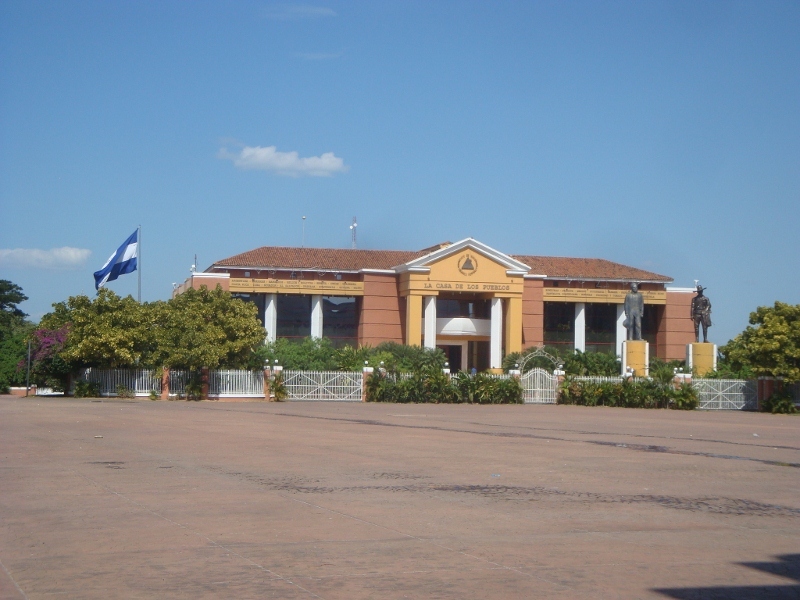 Nonetheless, Managua is the epicenter of Nicaraguan society, and all Nicaraguans refer to it for its abundant cultural activities. 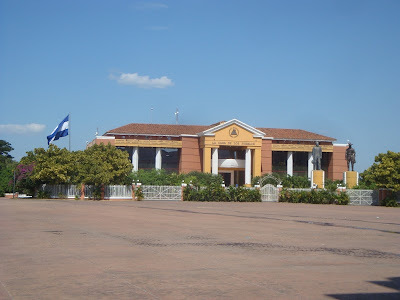 An identifying feature of Managua is the legacy of a terrible earthquake in 1972, in which thousands were killed and most citizens of the capital were left homeless. Rubble can still be found in the capital, and half-destroyed buildings are occupied by squatters living in unimaginably insecure and degrading conditions, in an area once graced with urban, middle-class architecture. 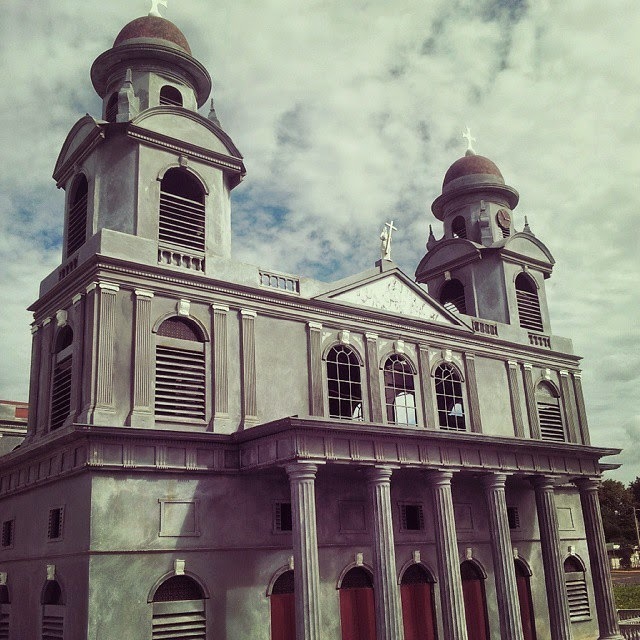 Nonetheless, a few structures remain from the past, and there are other gems in Managua, too. Here are some photos from downtown Managua, near the epicenter of the terrible 1972 earthquake. 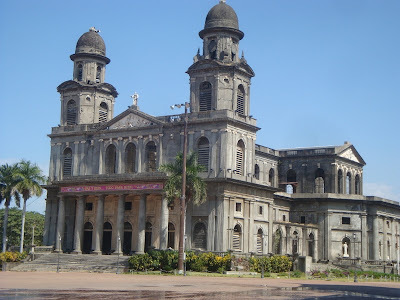 Managua "old" cathedral, now in ruins. Photo by Joyce Procure. The former downtown area of Managua languished for decades after the earthquake. The cathedral unusable, entire neighborhoods turned to rubble, and shells of buildings inhabited by indigent people in appallling conditions. 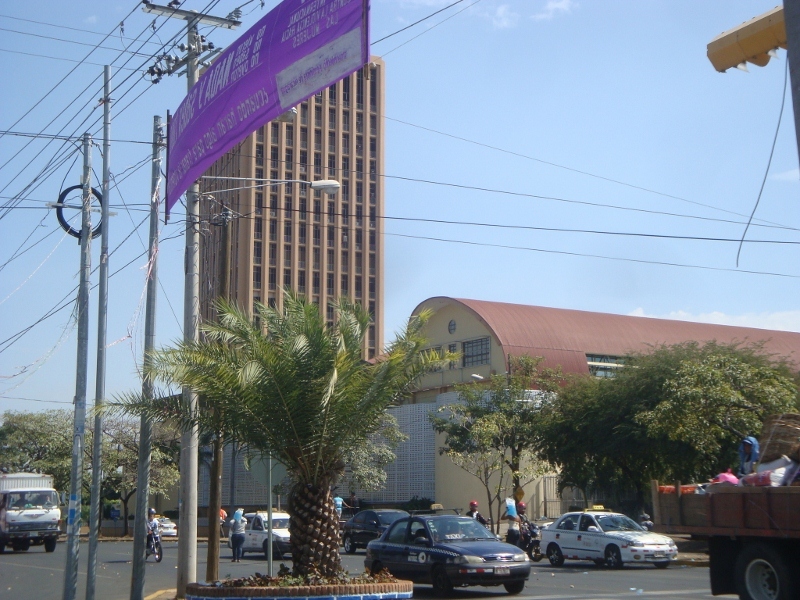 Some functions continued in downtown Managua after the earthquake, for instance, the National Palace was left strong, as was the Bank of America building. But ruins and extreme poverty were everywhere, along with all the social ills that accompany them. 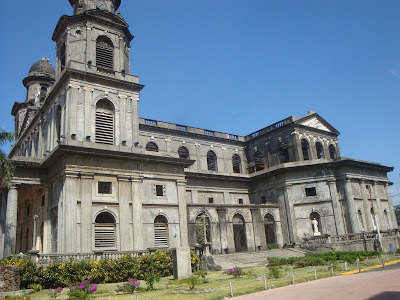 Side view of the ruins of the "old" Managua cathedral. Photo by Joyce Procure. The area has recently become dramatically revitalized through the injection of large sums of money from the government. Parks have been restored and police are present day and night to make them safe. Slums and rubble have been cleared in several areas, replaced by housing projects. Decent housing for poor people has become a primary priority again, after a long hiatus. The National Palace withstood the 1972 earthquake intact. Its strong, imposing lines suggest German styles from the 1930's. Photo by Joyce Procure. Only a few years back, a visit to this area was best left to the valiant. Today, the area is safe and is gaining traffic and life. Managua once again has a center. 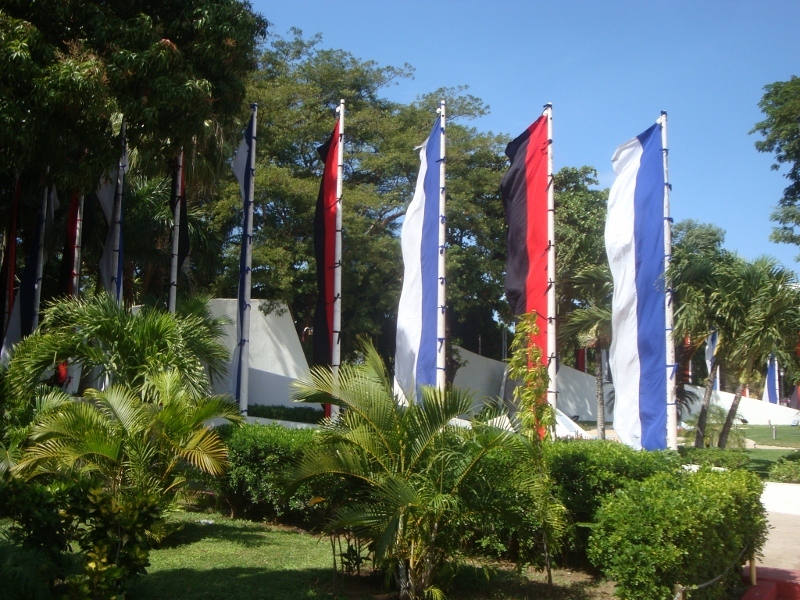 The banners strung on the poles are based on the blue-and-white national flag, and the red-and-black Sandinista flag. Behind the flags are found the tombs of Sandinista leaders Carlos Fonseca, Santos Lopez, and Tomas Borge. Photo by Joyce Procure. 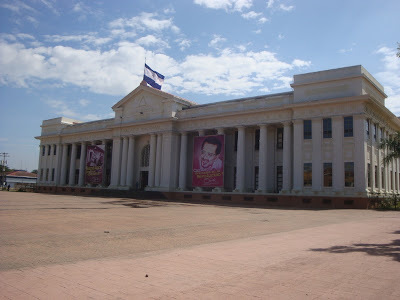 Managua continues to be the center for culture in Nicaragua, where concerts and plays are found and all kinds of attractions are found, particularly for the person who speaks Spanish. The Presidential Palace was built during the last decade of the twentieth century with financing from Taiwan. Photo by Joyce Procure. The Nicaraguan National Assembly occupies what is known as the Bank of America Building in downtown Managua. This building was among the very few multistory structures that survived the 1972 Managua earthquake. Photo by Joyce Procure. Prior to the 1972 earthquake, the Managua Cathedral was utilized by the upper classes of Managua. 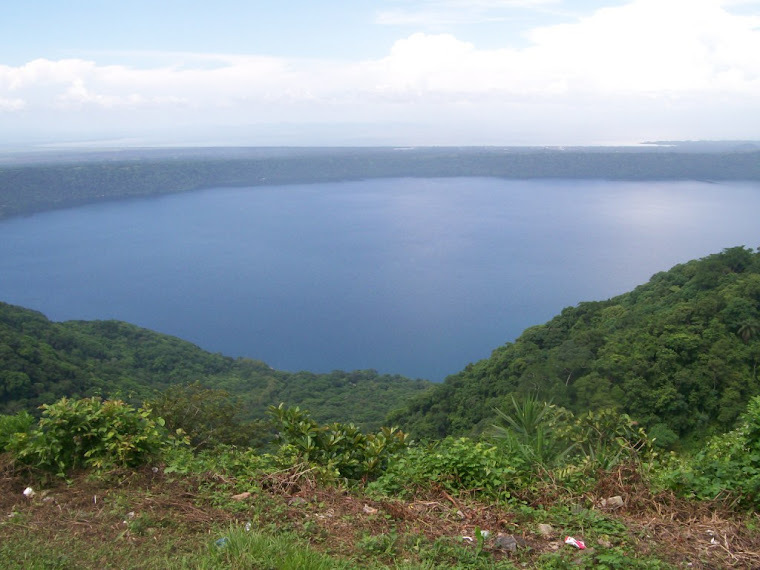 Managua is still beautiful, in surprising ways!